He might as well have been a unicorn, or a character straight out of a Disney nature film. I mean, a 120-pound wild wolf just shows up one day, on a frozen lake on the outskirts of Juneau, Alaska, and wants to play with our dogs. He's tolerant of people in general, and even friendly to some. He’s super-intelligent and interactive and social, and we get to know him as an individual. Yet the whole time he remains a wild wolf, hunting for his own food. He didn’t become habituated to people; he arrived that way, as if he’d fallen from the sky. You could suppose he was the archetypal wolf that came to lie by our fire millennia ago and became, through domestication, man’s best friend. Despite constant threats, he managed to live in the collective shadow of 30 thousand people for six years—and it would have been longer if not for the dark side of human nature, embodied by the two losers who killed him. Except for that last part, the entire story was magical, one of those experiences that transforms not just individuals, but an entire community. We’re talking about a wolf that ends up with two streets named after him, as well as a coffee and a beer. More than a hundred people show up at his memorial service, and a plaque is erected in his memory. Stuff like this just doesn't happen. But it did. Even now, having spent seven years living this story and another three writing it, with photographs that anchor the entire span of events in reality, the whole thing seems more like a dream than reality. Onward, to the castle, torches lit! Or at least, toward it. I'm not quite done winding up. The page 99 test is an intriguing premise. I heard it for the first time in a creative writing seminar some years back; thought then, and still do, that it holds some water. Plenty of books start wonderfully, and wander off into the brush and get hung up within a hundred pages, and never do recover. However, I'm not sure the test works always, or with everything. Page 99 is, after all, an arbitrary number that can be altered by layout, font, page size, page breaks, and so on. After all, page 99 could be blank or nearly so, right? Or a photograph; I have 30 gray-scale images layered through the text, introducing and ending each chapter. Not to mention, the 99 test depends on the structure and genre of the book in question. I think it probably works better for fiction than nonfiction, and A Wolf Called Romeo fits the latter. wolves deliberately seek bears — sometimes a cub or young brown/grizzlies, but especially black bears — as food. A number of such predatory attacks have been recorded in Alaska and Canada, and there’s at least one documented case of a pack digging out, killing, and eating a winter-denned bear. Though not predatory in nature, that wolf and grizzly brawl I witnessed thirty-some years ago reflected the general antipathy the species hold for each other. More recently, I witnessed the obvious fear wolves can trigger in black bears. One spring some years ago, in a distant inlet of Glacier Bay, photographer Mark Kelley and I sat perched on huge granite boulders, leaning into our cameras as two enormous, fight-scarred males jockeyed for turf and mating rights. Suddenly, though, a gray blur shot out of the trees, straight at the bears, and the two broke and ran, fleeing a wolf that might have weighed eighty pounds. The wolf was probably just running off the bears from a nearby den site or hunting area rather than launching a predatory attack, but the utter panic the bears displayed was unmistakable. Both brown/grizzly and black species occur in the upper Mendenhall, with the latter far more common; and younger animals, far less formidable than adults, could easily fall within the abilities of a wolf like Romeo now and then. But in such a limited area, the number of young bears was too small to provide a dependable food source. All told, that was the sum of Romeo’s prospective menu; all of the abundant, easily accessible items more coyote fare than lupine, it seemed, and standard fare scarce or problematic. What, then, was he eating? Following the black wolf’s trails, I came across kill remains and teased apart dozens of scats. In them I found the bits of bone and hair that bore witness to the stuff from which this wolf was built. I sat on the snow-covered ice, peering into my camera's viewfinder as flakes sifted from a low sky. Gus curled next to me, patient as always. Twenty yards away, Romeo stood against the Big Rock, and I waiting, finger on the shutter, for him to lift his muzzle and howl. The afternoon lay quiet, the ice so new, so thin that it creaked and bowed underfoot. Winter had drifted down from the high country, again, and with it the black wolf--returned for a second winter among us. Miracle enough that he had stayed the previous winter and into spring, even more that he would disappear one April evening--gone, as we knew he would be one day--and return months later. Of course we had worried ourselves sick that he'd been killed, bu we'd also celebrated his possible survival, and perhaps a home with a new pack. There had been no way of knowing which was true, and either way, we had no choice but to let go as best we could. Now he was back, and for all the solidity of his dark shape against the snow, and the insistent lines of his tracks, he seemed more apparition than ever. Our first season of the wolf may have been chance; now we knew he'd chosen this ground not once, but twice, deepening the mystery of this solitary wolf and his bond to this place. There's plenty of that, right up to the end; and I don't think the page 99 test here prepares you--sure as hell not for the parts I can't even read quietly to myself without choking up; and when I've read those passages to audiences large and small, they sniffle along. So, my final response to the test is a bit of yes, and enough no to balance it out. But really, the validity of the page 99 test is more for the reader to decide. As T.S. Elliot wrote in Four Quartets, "The rest is not our business." R. Charli Carpenter is professor of political science at the University of Massachusetts-Amherst, specializing in international relations, gender and political violence, transnational advocacy networks, human rights, and the laws of war. She is the author of Forgetting Children Born of War: Setting the Human Rights Agenda in Bosnia and Beyond, Innocent Women and Children: Gender, Norms, and the Protection of Civilians, and editor of Born of War: Protecting Children of Sexual Violence Survivors in Conflict Zones. 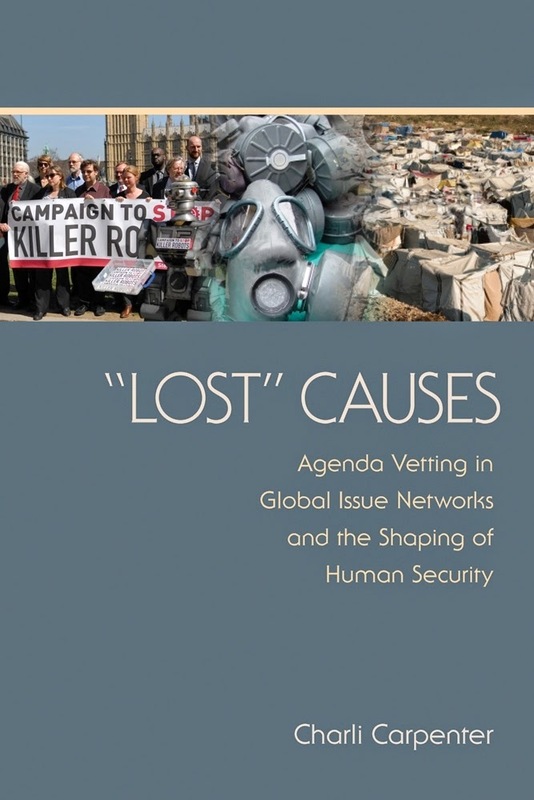 Page 99 of "Lost" Causes is an excerpt from one of the three case studies that illustrates the broader argument - the story of how autonomous weapons got on the international agenda. The bigger question in the book is why some issues get picked up by global advocacy networks and others don't, and the answer to the question is about the social relations and power dynamics within global networks themselves. I develop this argument broadly in the first two chapters, then illustrate it with three case studies of norm entrepreneurs attempting to market their issues to global advocacy "gatekeepers." In the case of autonomous weapons, the issue of their humanitarian and ethical implications was first championed by two separate networks of scientific experts: the International Committee for Robot Arms Control (ICRAC), which opposes the development and deployment of autonomous weapons, and the Consortium on Emerging Technologies, Military Operations and National Security (CETMONS), which tended to argue in favor of R&D into such systems while insisting that any such systems be programmed to comply with the laws of war. Today, advocates of a straight-line ban on such systems are generally in contestation with those who see autonomous weapons as a potential humanitarian advance over human soldiers if properly programmed, but in the issue formation period between 2007-2012 the synergistic interaction between these two networks helped promulgate the more basic idea that global governance was needed in this emerging area. Even though these two networks possess different network ties, adopt different outreach strategies, and are somewhat at odds prescriptively (both in their substantive claims and the extent to which they take open positions), they do enjoy considerable synergy and interaction. Both groups aim to spark a wider discussion about the ethics of autonomous weaponry in advance of their widespread deployment and use in contemporary battle-spaces. And while these are correctly understood as distinct epistemic networks, individuals in each enjoy social ties with both... most importantly, both were simultaneously courting advocacy elites to legitimate and disseminate the notion that the ethical dimension of advances in autonomous weaponry should be front and center on the international agenda. From the start, both CETMONS and ICRAC's founders recognized that to really promote ethical standards they needed the assistance and legitimation of professional advocacy organizations. Indeed, most were extremely humble about their own abilities as advocates, preferring instead to incite a discussion that would be promoted by ohters. In 2011 Robert Sparrow told me, "ICRAC suffers from being an organization comprised of academics... academic research and political activism aren't the same thing. People have full-time research or teaching commitments, and at the moment we don't have the activist base to really motivate arms control around these particular weapons." Similarly, Ron Arkin never pictured himself as an advocate, describing himself as "just a roboticist" who recognized hat if norm development would take place in this area it would be organizations with credentials and connections in the area of war law that would need to carry the banner. According to [Noel] Sharkey: "I'm not trying to be an advocate. I would like other people to take it up who are better able to. All I am is an academic with some access to the media and some technical expertise, but I don't see myself talking to the UN..."
As such, this page does indeed provide a glimpse into the overall argument of the book and a teaser into a case study that nicely illustrates these broader dynamics. Ethical attention to autonomous weapons was sparked off by norm entrepreneurs circa 2007-2009, but only hit the global advocacy agenda upon the launch of the Campaign to Stop Killer Robots by Human Rights Watch in 2012. This confirms the basic claim that network centrality confers important agenda-setting influence on specific organizations. But the wider book is a theory how those organizations decide which issues to focus on. That story, detailed in the subsequent pages of the "killer robots" case study and the other cases on collateral damage compensation and infant male circumcision, is also a story of intra-network politics, as I explain on p. 5: "Advocacy elites choose issues not just based on their merits, or mandate, or the wider political context, but partly on calculations about the structure of their institutional relationships - to other actors, other issues, and to networks themselves. Therefore, understanding how to use network ties strategically is a key ingredient in any recipe for successful global norm entrepreneurship." Molly Tambor is assistant professor of contemporary European history and women and gender at C.W. Post Long Island University. Italian Communist Teresa Noce, one of the first 45 women elected as members of Parliament in Italy after women first achieved the vote there in 1945, and infamously known as “Madonna Tempesta” (something like “Our Lady of the Hellstorm”) for her loud mouth and stubborn temper, reaches the heights of legislative victory on page 99, as her 1950 law creating obligatory paid maternity leave, child care, and nursing centers for working women nears passage. Despite the intensity of the Cold War conflict in Italy at the time, her cooperation with women members of parliament from the Christian Democrat party and their argument that the new democratic constitution passed in the wake of Mussolini’s fall from power requires the recognition of women’s equal rights are about to overcome all obstacles. 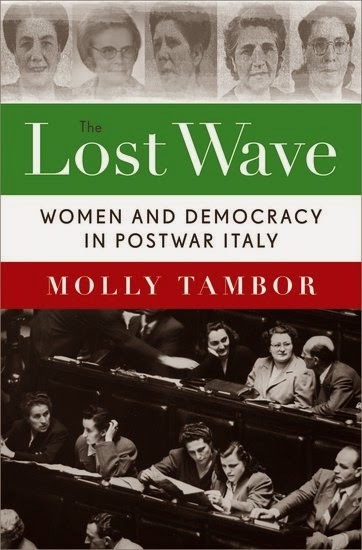 The law was the first of nearly twenty such cooperative campaigns among women activists in the following two decades using constitutional rights to argue that women not only deserved equal rights, but that women’s full citizenship in Italy was the only certain “bulwark of democracy” against either the return of Fascism or the worst excesses of Cold War brinkmanship. In a time when what it means to be a woman politician has again become a pressing question not only of policy, but of gender identity—when the press debates whether Hilary Clinton can be both a president and a grandmother—the page is a reminder of the bright spots in the political history of women and the state. A somewhat consoling result, and perhaps a promise for the future. Learn more about The Lost Wave at the Oxford University Press website. Mike Stobbe is a medical writer at the Associated Press. 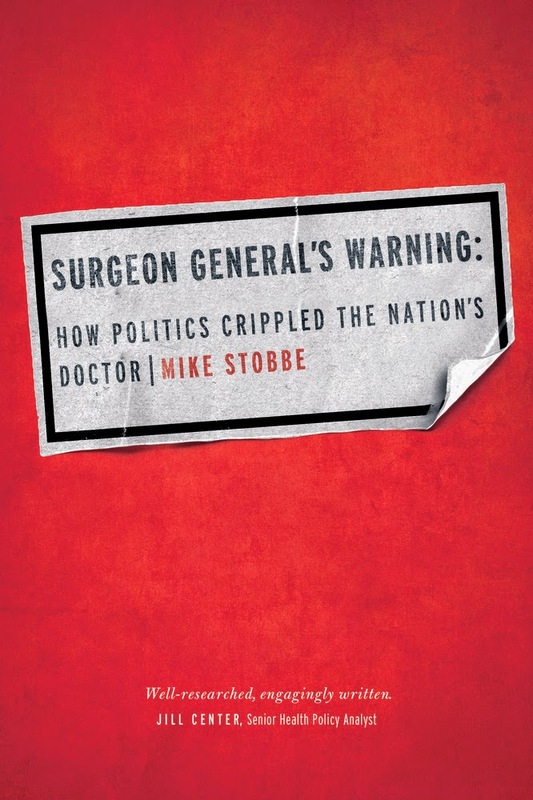 My book is about the rise and fall of the surgeon general. Page 99 happens to mark one of the main turning points of my narrative, when the stage is set to allow the fall to begin. The earlier part of the book speaks mainly about the surgeon general’s origin and ascension. The job was created after the Civil War to turn around a ruinous collection of federal hospitals for sailors. The ambitious men who first held the job went beyond that assignment, leading a growing government effort to manage disease outbreaks and safeguard the public health. By the early 1950s – where we are at page 99 – the surgeon general was the health officer of the nation, overseeing many thousands of employees organized in such agencies as the NIH and the CDC. But this page lands in the middle of the tale of Leonard Scheele, known as “the last happy surgeon general.” Scheele was powerful too, but held office during creation of the Department of Health, Education, and Welfare (HEW). Suddenly, Scheele was placed under a cabinet-level HEW Secretary. His first boss, a lady newspaper publisher from Houston named Oveta Culp Hobby, was uncomfortable with many health issues and gave Scheele great leeway. But her successors (and their lieutenants) proved less interested in allowing surgeons general to speak for HEW on health matters and to rule such a large portion of the federal health bureaucracy. Within only about 15 years, the surgeon general was stripped of his administrative powers. He was turned into a health educator, dispatched to speak at functions other HEW officials chose not to attend. The office would enjoy a resurgence in the 1980s when the remarkable C. Everett Koop held the post. But Koop managed to speak loudly from a weak pedestal. Denied real power and resources, it would take a combination of luck, allies and chutzpah for any surgeon general in recent decades to make an impact. Such a combination has been a rarity, and the surgeon general has largely disappeared. Learn more about Surgeon General's Warning at the University of California Press website. Toby Wilkinson is an Egyptologist, Fellow of Clare College and Head of the International Strategy Office at the University of Cambridge. In The Nile, I examine Egypt’s long and colourful history from the perspective of the silver thread that unites the past, present and future of this intriguing country: the river Nile. Taking a journey downriver from Aswan to Cairo, I explore the people, places and events that have been shaped by the Nile and that, in turn, have shaped Egypt’s unfolding story. Twenty-five centuries ago, the ancient Greek historian Herodotus famously remarked that ‘Egypt is an acquired country... the gift of the river’. His observation remains true to this day: since time immemorial, lives and livelihoods in Egypt have been shaped by the river’s rhythms: from the earliest art (prehistoric fish-traps carved into cliffs above the Nile) to the Arab Spring (fought on the bridges of Cairo). For over two thousand years, the Nile and the ancient monuments along its banks have also proved a draw for visitors. The same stretch of water that bore Julius Caesar and his lover Cleopatra has also witnessed the comings and goings of Christian hermits, Arab poets, European explorers, and a whole host of artists, writers and adventurers. All have been shaped by their encounter with Egypt; all have left their mark. three full sketchbooks, 272 sketches, and a panorama of Cairo: in short, enough material to ‘serve me for the rest of my life’. Over the next decade, he made a series of new drawings from his sketches and published them as 247 large lithographs in the multi-volume The Holy Land, Syria, Idumea, Arabia, Egypt & Nubia. It was the most comprehensive series of views of the Middle East ever presented, and won huge critical and popular acclaim. The paintings caught the imagination of the British public and made Egypt the most fashionable destination for the adventurous traveller. One group for whom Egypt held a special attraction were sufferers of tuberculosis. Wealthy ‘invalids’ in search of warmer climes took to spending their winters in Egypt. ‘In about a week the sunshine and warm air of Luxor enabled me to sit in the garden, in another week I could mount a donkey, in a month I was able to ride to Karnak… Upon me, at all events, the effect of the climate was little short of miraculous’. Eccentric, pioneer, folk heroine: her seven years living in a ramshackle house atop the roof of Luxor Temple endeared her to the local people and made her a tourist destination in her own right, adding yet further to Luxor’s allure. Four decades later, another invalid staying in Luxor discovered not just winter warmth but a passion for Egyptology. Lord Carnarvon also encountered an impecunious but brilliant archaeologist named Howard Carter, and together they made the greatest archaeological discovery of all time. The treasure of Tutankhamun caused a world-wide sensation, and established a popular fascination for the Nile and its wonders that has never abated. William Mulligan is the author of The Creation of the Modern German Army and lecturer in modern history, University College Dublin. The test works reasonably well, I think, in this case. On page 99, one section of the chapter on 1915, on the Ottoman participation in the First World War and the Armenian genocide, ends. It is followed by a section considering the decision of Italian leaders to enter the war. The first part concludes with the reaction of the Allied powers to the Armenian genocide and to the Ottoman empire's role in the war. I argue that Allied war aims against the Ottomans, which included extensive territorial claims, were not shaped simply by geopolitical ambitions, but also by moral considerations. Allied statesmen denied that the Ottoman empire had a place in a community of civilized nations. In an era when "civilization" was a marker of international respectability, the Allied charges that the Ottoman empire was a barbaric regime that 'violated the rights of man' justified its very destruction. It reflected historical suspicion about the Ottoman empire's place in Europe and that empire's role as an ally of Germany, itself condemned as barbaric in 1914. The First World War was more than a conflict centred on territory and security between the great powers. It was a war about political and ethical values, which had consequences for the ways in which territorial dispensations were made, and for the ways in which security was reimagined as more than the balance of power, as Peter Jackson has suggested. Security was also bound up with notions about civilization, international law, commerce, constitutional reform, and labour regulation. The second part of page 99 begins the story of Italy's entry to the war. Similar issues of geopolitical interest and moral values are evident, as Italians debated the purpose of entering the war - for national territory, for the defence of democracy, to unify the nation through war, or simply to stay out. On page 99, I show how Italian decision-making was influenced by the perception that the Ottoman empire was nearing collapse. This reflects a wider concern of the book, to show how the different theatres and actors interacted with each other. The war was a messy, complex event, but it was framed as a confrontation of ideas as well as a clash of the great powers. And this explains its duration - it is harder to find a compromise about values than it is to splice and dice territory in a compromise peace. 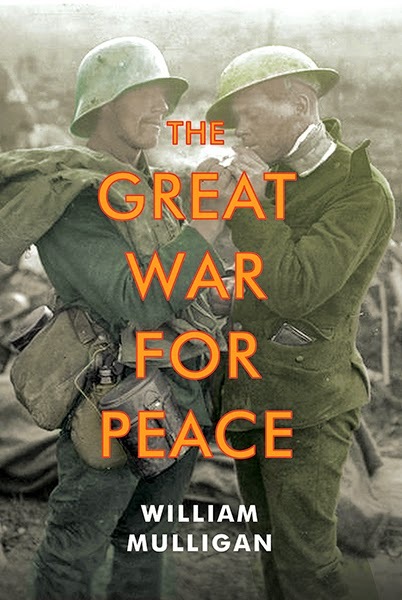 Learn more about The Great War for Peace at the Yale University Press website. 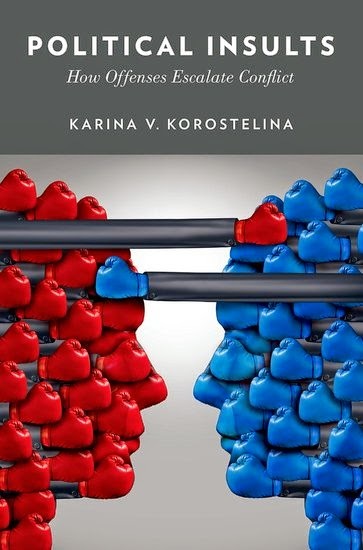 Karina V. Korostelina is Associate Professor and Director of the Program on Identity, History, and Conflict at the School for Conflict Analysis and Resolution at George Mason University. People, organizations, social groups and even countries insult each other every day. Many believe that people offend each other because of frustration, bad manners, or satisfaction from hurting other people. Insult thus is perceived as a common act that reflects aggressive tendencies in people. But can insult help reveal the deep motivations of insulting sides? Can insult show the real needs behind aggression? Can our knowledge about insult empower us in dealing with an insulting party? The insults discussed in this book occurred in different countries, reflect different issues, and involve different participants. Five women entered the Cathedral of Christ the Saviour in Moscow, shed their winter clothing at the altar and began a performance of “Punk Prayer”, containing crude language toward Putin and Kirill I, the Moscow Patriarch of the Russian Orthodox Church. Elderly veterans were assaulted near the World War II monuments, and young people were frying eggs on the eternal flame near the Tomb of the Unknown Solder in Ukraine. A small island in the Japan Sea provoked a diplomatic spat between Japanese and South Korean leaders, payments of homage to war criminals, landing on a disputed island and demands for apology and compensations from both sides. The quick pardon by Azerbaijan's president of the repatriated killer of an Armenian army officer has sparked outrage in Armenia and Hungary, as well as a diplomatic maelstrom involving NATO and the European Union. The book shows that the form of insult that people use to offend each other indicates their group incentives, problems in interactions, or grounds for conflict between two parties. These insults reflect the issues of social identity and power relations between groups. People use insults because they want to strip the other party of positive identity, increase distance or emphasize difference between parties, put blame on others and justify their actions, deny rights of other party and show their privileged or superior position, strengthen their power over others, or legitimize themselves and de-validate others. Page 99 describes several insults traded by Japan and China in the conflict around Senkaku Islands. These statements “created a legitimacy insult confirming the lawfulness of ownership by Japan and rejecting any rights claimed by China.” China’s reaction to this legitimacy insult included not only reaffirmation of its rights over the islands and denial of any Japanese claims, but also raised questions about the adequacy of Japanese foreign policy. Thus, China also created a legitimacy insult, presenting Chinese ownership of the islands as real and beyond question and Japanese attempts to purchase islands as illegal. The second type of insult presented on page 99 is the divergence insult. Certain leaders in Japan warned against radical moves that could harm Sino-Japanese relations. On June 6, 2012, the Japanese ambassador to China, Uichiro Niwa, declared, “If Mr. Ishihara’s plans are acted upon, then it will result in an extremely grave crisis in relations between Japan and China.... We cannot allow decades of past efforts to be brought to nothing.” However, the foreign minister, Koichiro Gemba, as well as many right-wing politicians, disowned Niwa’s statements. Portraying the sale of one of the islands as strictly an internal issue, Gemba said: “The change of ownership is a domestic matter that does not concern the international community.” The chief cabinet secretary, Osamu Fujimura, stressed that Niwa’s statements reflected the ambassador’s personal position and not the government’s official stance. Ishihara also strongly criticized the ambassador, suggesting that Niwa needed to learn more about the history of his own country before making such comments, and questioning his ability to serve his country’s interests: “He is not qualified to be Japan’s ambassador to anywhere.” Niwa apologized for his comments in a letter to Gemba, stating, “I am extremely sorry. I will not make comments like this.” Ambassador Niwa was presented as a person who was disloyal to his country, did not know and respect its history, and could not protect its interests. Depicting the ambassador in this light, government officials and nationalists created a divergence insult that positioned him as outside mainstream ideology. The book shows how knowledge about different forms and types of insult can empower the offended party in dealing with offences and what strategies should be used in each case. Learn more about Political Insults at the Oxford University Press website. Clare Huntington is a professor at Fordham Law School. Her extensive legal experience includes clerking on the U.S. Supreme Court and working for the U.S. Justice Department. In addition to international development work in India and Senegal, Huntington was a social worker in New York City’s foster care system. [T]o house these multiple generations, families often want different spaces, with separate cooking facilities or even a separate building, located next to the main house, but single-family zoning rules make this difficult. Developers have to contend with zoning boards that are unwilling to approve variances that would allow the construction of homes that meet the needs of multigenerational families. This example illustrates the book’s primary contribution to the debate about families and instability—the role of the law. It is well known that a child’s chances in life are affected by experiences in the first few years of life. It is also well known that families across the income spectrum are struggling to provide children with the relationships they need during these crucial years. From domestic violence and poverty to unemployment and family breakdowns, the state of the American family is not good. But what is less known is that the law is part of the problem. Too often, instead of helping strengthen families, our legal system undercuts family relationships, making it harder for parents to provide children with the relationships necessary for healthy child development. Page 99 also showcases my writing style. The book uses lots of specific examples and stories to bring theory to life, ranging from Aristotle to the work of a World War II nutritionist. 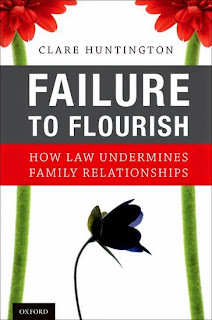 After page 99, I offer a new vision for an emotionally intelligent family law, arguing that we must re-orient the legal system to encourage healthy family relationships. This does not mean an all-encompassing welfare state, but rather key supports and interventions at critical stages. The law can and should help young adults delay childbearing, encourage long-term commitment between parents, and support parents in their key work nurturing children in the early years of life. This won’t be easy, and there are plenty of political flashpoints, but it is essential work. Learn more about Failure to Flourish at the Oxford University Press website and Clare Huntington’s website. William A. Blair, Liberal Arts Research Professor in U.S. History at the Pennsylvania State University, serves as director of the Richards Civil War Era Center and as editor of the Journal of the Civil War Era. In the case of With Malice Toward Some, the Page 99 rule does not quite hold true. This part of the book marks the end of Chapter 3 where I try to tease out Abraham Lincoln’s use of international law to support various executive measures taken during the Civil War. The president was pragmatic in his thinking, borrowing from a wide range of sources. It is doubtful that he consciously sought international law to fortify his determination of “military necessity.” Yet he applied international principles—because it made sense and helped to justify policies such as military emancipation. But this represents only a small slice of the book which deals with the broader issue of how northern “popular” notions of treason allowed for hard measures against not only the Confederate traitors but also those people suspected of disloyalty in the Union. By popular, I mean rationale formed by the public outside of civil courts but also in tracts, legislative halls, executive chambers, and actions by mobs in the streets. Much like this country closed ranks after the terrorist attack on 9/11, the Civil War public adopted ideas about punishing traitors that allowed soldiers to arrest Confederate women who taunted them; caused thousands of arrests by the military in the loyal states for something called “treasonable behavior”; and allowed authorities to suppress newspapers, arrest editors, and deny access to the ballot. Treason also assumed a partisan dimension as a means of winning elections by branding the opposition as disloyal. But there was a good side to this mentality. It helped save the nation. And it allowed for the seizing of slaves from Confederates, contributing to greater freedom in this country. So the public’s notion of treason also served a greater good. That kind of paradox runs throughout the book. Ultimately, the book includes more than the Civil War. It covers the way treason was deployed during the sectional crisis over fugitive slaves, Kansas, and John Brown’s Raid on Harpers Ferry. And it takes the analysis into Reconstruction to understand why no rebel was hanged for treason. Even though no one was executed, the rebels did receive punishment through loss of property and some of the rights of citizenship—at least for a time. Learn more about With Malice toward Some at The University of North Carolina Press website. Chiara Bottici is assistant professor in the Department of Philosophy at the New School for Social Research and the author of A Philosophy of Political Myth, Men, and States, and, with Benoît Challand, The Myth of the Clash of Civilizations and Imagining Europe: Myth, Memory, and Identity. When I was invited to perform the “page 99 test” on Imaginal Politics, I was very skeptical. How can a single page reveal the quality of a whole book? And, then, why page 99? Why not page 98 or 97? Why not rather 199, towards the end of the book, if the point is to get a sense of the whole argument? The precision of that number -- 99 -- troubled me, but, at the same time, I also felt intrigued. So here is what I did: I reluctantly grabbed a copy of my book, I opened it randomly, and, first surprise, it was indeed page 99! But maybe it is just a coincidence, I thought, maybe it is just because the book is 250 pages, so page 99 is more or less in the middle (yet, the middle position is rather significant in itself). If we consider these passages about the role of exemplary images alongside the passage about the need for an enlarged mentality, it becomes clear why politics is imaginal. In order to assume an enlarged mentality, we need to be able to put ourselves in the shoes of others, and imagining things from their point of view is the chief means to do so. “Political thought” Arendt writes “is representative” (Arendt 1968b:237). Hence the crucial role of literature: it is by representing the conditions of others through the vivid pictorial representation of their situation that, to paraphrase Arendt, we can train the imagination to go visiting. This passage, rigorously appearing in the middle of page 99, not only gives you a sense of the main thesis of this book, but it also brings together the different threads of my previous ones: myth, memory, and religion play a crucial political role because they stem from our capacity to imagine – a capacity that, although we tend to forget it, is at the very center of what politics is about. Conclusion: from now on, I will always begin a book from page 99! Learn more about Imaginal Politics at the Columbia University Press website. Mark Lewis is the co-author of Himmler's Jewish Tailor: The Story of Holocaust Survivor Jacob Frank, the oral history of a Polish Jew who was the head of a clothing factory at the SS-run labor camp on Lipowa Street in Lublin, Poland. Lewis received a Ph.D. in European history from the University of California, Los Angeles, and is an assistant professor of European history at the College of Staten Island, City University of New York. What’s the best way to prevent war crimes? Ensure an army is well-supervised and understands the culture of the civilians in an occupied area? Or establish international rules that should be enforced by criminal courts? From the late 19th through the 20th century, international legal organizations such as the Red Cross, the International Law Association, and the International Association of Penal Law took different positions on this question. As a result of World War One, a new idea emerged: serious violations should be prosecuted by an international tribunal to restore morality and the validity of international law. The Birth of the New Justice argues that legal organizations took this idea and applied it to areas other than war crimes, such as aggressive war, terrorism, and genocide—not to create a liberal international order, but to deal with pressing problems that fit the organizations’ own historical missions. Page 99 deals with the International Law Association (ILA), which began in the 1870s as a group of radical pacifists but mellowed to become business-minded lawyers interested in creating global legal codes. After World War One, a British member of the ILA, Hugh H.L. Bellot, wrote a plan for an international criminal court for war crimes because he was dissatisfied with German war crimes trials in the 1920s. Bellot’s plan also called for the court to prosecute international crimes such as “white slave” trafficking and piracy. Lawyers argued these actions offended international morality and disrupted international commerce, reflecting the attitudes of the European bourgeoisie before and after World War One. Some lawyers in the ILA wanted a more powerful court that would also have jurisdiction over aggressive war and attacks against minorities, but the ILA rejected these ideas, as a majority of members believed that the League of Nations would never approve such a court. In fact, they were right, since the dominant trend in the 1920s was to use the League to regulate diplomatic disputes, not subject individuals to criminal prosecution. States were not ready to accept that their own officials could be held criminally liable for starting wars. A system to prosecute state agents for violence against minorities was an equally hard-sell. Central and Eastern European states were already obligated to uphold certain “minorities treaties” and did not want additional international pressure to enforce them. Other legal organizations pressed for the creation of an international criminal court in the 1930s and ‘40s. The idea was partially realized at Nuremberg in 1945-46, but that court was not permanent and did not rely on a statute that all the world’s states had agreed upon before World War Two. Even after that war, the dominant mode of enforcement remained domestic courts. The idea of international enforcement had emerged as an intellectual theory and cause for activism, though the Cold War and the doctrine of state sovereignty were serious obstacles. Learn more about The Birth of the New Justice at the Oxford University Press website. As the book’s title suggests, my work explores the unintentional aspects of development as foreign policy. This book focuses on President Kennedy’s Alliance for Progress in Bolivia, which was one of the highest per capita recipients of US aid at the time. Basing my narrative on declassified documents in Bolivian and US archives, and interviews with key actors in both countries, I conclude that development has a tendency to encourage creeping authoritarian responses to political unrest. According to my findings, this trend was exacerbated by a close intimacy between USAID and CIA covert operations. These themes are on full display on page 99, where I wrap up my story of how the Kennedy White House channeled USAID funds to arm a CIA-backed peasant militia in July 1963. The operation aimed to assassinate leftwing Bolivian labor leaders who were leading mine strikes against the harsh conditions attached to US development funds. The attempt failed, but liberal developmentalists in Washington were nonetheless pleased that the Bolivian government showed a willingness to employ force to implement USAID programs. Labor’s voice was sharply restricted in Bolivia, and hundreds of leftwing miners were fired, with US Embassy officials performing “spot-checks” to ensure that “Commie-liners” were the first to go. Page 99 also begins discussion of Kennedy’s authorization of a massive CIA psychological operation in mid-1963 to “enable [President Víctor] Paz to consolidate his control” by attacking leftwing influence throughout Bolivian society. As I demonstrate, these heavy-handed covert actions were unfailingly justified in the name of “development,” and they were mostly carried out under the auspices of USAID. Page 99 therefore represents the book’s turning point. After August 1963, Bolivia’s authoritarian turn, backed by USAID dollars, led directly to the country’s full-scale militarization in November 1964. Thom van Dooren is an environmental philosopher and anthropologist at the University of New South Wales, Australia. His research is situated in the interdisciplinary field of the environmental humanities. A reader opening to page 99 of Flight Ways would find themselves in the thick of a discussion about the ethics and practicalities of ‘imprinting’ birds on people in endangered species conservation. I was led into this topic by a strange encounter. In June 2012 I visited the Patuxent wildlife research center in Maryland, one of the two main facilities in the USA that house whooping cranes (Grus americana). With their bright white feathers and vibrant red crowns, they are striking and highly charismatic birds. Unfortunately, they are also highly endangered. Reduced to fewer than 20 individuals in the first part of the 20th century, in the 1960s a complex program of egg collection and captive breeding was initiated to hold the species back from the edge of extinction. During my visit to Patuxent I was initiated into the strange world that has been built around these birds. Here, staff dress up like cranes putting on white costumes and hats and visors to cover their human forms. Where appropriate they carry a long puppet: a stick with a model whooping crane head on the end. Staff are also required to be completely silent around birds; although in some cases they wear small audio devices that play comforting crane vocalisations. As a visitor to Patuxent, I was required to follow these same dress standards. humans keepers are required to be intimately involved in the daily lives of young birds, teaching them to look for food and encouraging the walking and swimming necessary for healthy development. But humans must somehow be present without becoming the object of imprinting. They must not only cover over their own human form to prevent birds from imprinting on it, but at the same time produce the form of an adult Whooping Crane, so that birds can imprint on it. (page 99). This somewhat strange interaction with endangered cranes is one of many such encounters discussed in Flight Ways. From Indian vultures to urban penguins, this book offers a set of tales of entangled people and birds in an effort to explore what life is like for those who must live it at the edge of extinction. How, in practical terms, do we keep these species in the world and at what cost to whom? What are the ethical stakes for the many whooping cranes who will spend their lives laying eggs for release but who themselves will never see the outside world? What about those birds subjected to invasive forms of artificial insemination to keep the species going? In short, page 99 offers a glimpse into the much larger question that animates this book: What kinds of human/bird relationships are taking shape at the edge of extinction and how might we re-imagine what is possible here? Learn more about the book and author at Thom van Dooren's website and the Columbia University Press. Elizabeth Beaumont is Associate Professor of Political Science at the University of Minnesota, where she focuses on civic engagement, constitutionalism, and democracy. The spectrum of popular sentiments expressed toward the proposed constitution ranged from effusive praise to outright, angry rejection and nearly every position in between. Some groups of citizens sent positive evaluations and messages endorsing ratification to their conventions. In Delaware, for example, one group’s petition endorsed ratification because this would lead to “peace, stability, efficacy, and prosperity in all the confederate states.” In Boston, nearly four hundred mechanics and tradesmen met at a tavern to adopt pro-ratification resolutions just before Massachusetts’ convention. Strangely, the influence of such civic disputes in creating an uneven and nearly unsuccessful ratifying process and an ambivalent and limited stamp of public approval is largely ignored. Indeed, most conventional studies convey a shrunken, skewed understanding of citizens’ roles in constitutional politics. The Civic Constitution challenges this by traveling across the 18th, 19th, and early 20th century to illuminate the constitutional visions and struggles of the broad swath of revolutionaries who motivated the Declaration of Independence and the first state constitutions; the streams of critics and antifederalists who influenced the national Constitution and Bill of Rights; the abolitionists who paved the way for the Reconstruction Amendments; and the suffragists whose battles provoked the Nineteenth Amendment. I argue that these groups were so important for initiating fundamental constitutional texts and commitments – such as free speech, equal protection of the laws, uniform national rights, and universal suffrage -- that they should be recognized as civic founders or co-founders of the Constitution. Through soapbox speeches, mass petitions, sermons and boycotts, dramatic protests and civil disobedience, these men and women worked to redefine fundamental law. Challenging established authority, they advocated vital new understandings of popular self-governance, rights and liberties, and citizenship itself. Indeed, though their roles have long been neglected, these civic reformers shaped the legal text and terms of modern constitutionalism and civic membership. 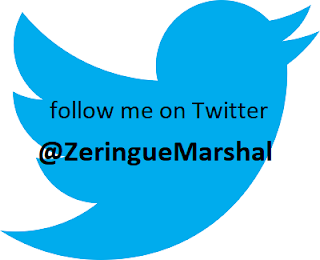 By shifting our focus to citizens’ ideas and actions, I hope to provide greater understanding of American constitutionalism, civic life, and democracy itself. But more than simply revealing the role of people and civic groups in past constitutional conflicts, The Civic Constitution provides rich groundwork for understanding important controversies of our own era. Learn more about The Civic Constitution at the Oxford University Press website. 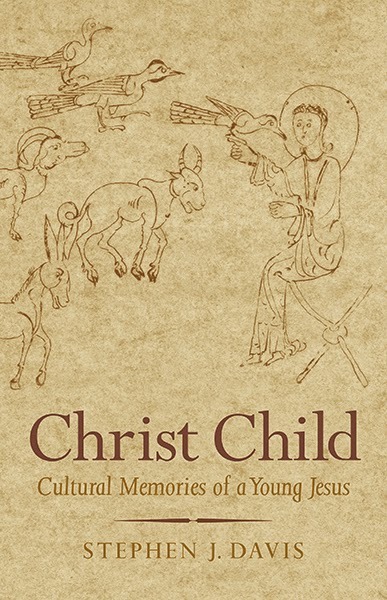 Stephen J. Davis' "Christ Child: Cultural Memories of a Young Jesus"
Stephen J. Davis is professor of religious studies, executive director of the Yale Monastic Archaeology Project, and master of Pierson College at Yale University. Christ Child is about stories that early Christians (and later Jews and Muslims as well) told about Jesus’ early years between the ages of five and twelve. Our earliest source for such stories is the so-called Infancy Gospel of Thomas, but in antiquity this collection of tales was simply referred to as the “Childhood Deeds of Jesus”—in Greek, the Paidika. Several of the stories pertain to Jesus’ encounters with teachers in the classroom. Such interactions were conflict-laden. The young Jesus resists his teachers’ instruction, talking back to them and displaying his own precocious, divine knowledge. The teachers react with violence, striking him on the head, and Jesus reciprocates by uttering fatal curses against his instructors. My approach to these stories is to draw on sociologies of cultural memory—on the social and cognitive processes by which people remember, and in fact creatively construct—the past in and through their present-day concerns and experiences. My fundamental argument is that adult readers in the ancient Mediterranean world would have turned to their own childhood recollections and to their imprinted, contemporary perceptions about children’s roles in trying to make sense of a young Jesus. On page 99 of Christ Child, I examine visual evidence related to classrooms in antiquity in an effort to see what ancient readers would have envisioned when they read stories about Jesus in school. At Pompeii and Herculaneum, paintings of students interacting with teachers survive on the walls of posh private homes. In one, a small child performs his lessons in the presence of a teacher sitting in a chair with papyrus rolls on the floor beside him. In another, much less sanguine scene, a student is held down by two of his peers while the schoolmaster whips him with reeds, a stark image of ancient corporal punishment. Other analogous images survive on numerous ceramic cups and vases from Greece and on a funerary relief from Neumagen, Germany. Such imagery of ancient educational practice would have served as ready-made sites of memory—cultural markers and signposts—for recipients of the Paidika. Indeed, the details of Jesus’ encounters with his teachers correlate in significant ways to what we know about teaching and learning at the elementary level in Graeco-Roman society. In what follows, I show how the Paidika stories intersected with the spaces and practices of late ancient education, and thereby served as a catalyst for memory work related to childhood performed by readers and hearers. Learn more about Christ Child at the Yale University Press website. Eric Helleiner's "Forgotten Foundations of Bretton Woods"
Eric Helleiner is Professor and Faculty of Arts Chair in International Political Economy, Department of Political Science and Balsillie School of International Affairs, University of Waterloo. I certainly didn’t plan this outcome, but I’m delighted to report that page 99 of my book is a vitally important one. Let me explain. Any student taking an introductory course in economics or world politics learns about the famous 1944 Bretton Woods conference. The meeting created new rules for the postwar world economy as well as institutions such as the World Bank and International Monetary Fund that remain at the center of global financial governance today. Although forty four governments were represented, students are usually taught that the Bretton Woods negotiations were de facto a bilateral affair between US and British policymakers who largely ignored the concerns and voices of developing countries. My book shows how incorrect that conventional view is. (I have had to completely rewrite my own lecture notes in the process of researching this book). Drawing on extensive new archival material, I show how US officials in particular saw the Bretton Woods negotiations as an opportunity to promote a new kind of global economic order that would be supportive of the development aspirations of poorer countries. Page 99 starts a chapter that demonstrates the strength of the American commitment to this innovative international development vision, a vision that had emerged initially out of extensive US consultations with Latin American officials even before the Bretton Woods negotiations began. Subsequent chapters demonstrate that this vision was also strongly supported by delegations from poor regions of the world including not just Latin American countries but also those from China, India, and Eastern Europe. The Bretton Woods agreements, in other words, were a product of much more than just Anglo-American discussions. They emerged from a new kind of “North-South” dialogue between rich and poor countries, out of which the pioneering international development goals of the meeting were born. The ambitious nature of Bretton Woods international development objectives did not survive the early Cold War years for some political reasons explained in the book. But I argue that these forgotten foundations of Bretton Woods remain highly relevant today when emerging powers such as China, India, and Brazil are seeking to reform the global economic order to better serve their development goals. The ideas of the Bretton Woods architects – who included many officials from these very countries - anticipated contemporary debates on this topic to a remarkable extent and they deserve renewed attention as we celebrate the 70th anniversary of the famous 1944 meeting this year. Learn more about Forgotten Foundations of Bretton Woods at the Cornell University Press website. Arthur Versluis, Chair of the Department of Religious Studies and Professor in the College of Arts & Letters at Michigan State University, holds a doctorate from the University of Michigan, Ann Arbor, and has published numerous books and articles. Versluis is the founding editor of Esoterica, and co-editor of JSR: Journal for the Study of Radicalism. American Gurus covers a vast range of American literature and religious history, beginning with American Transcendentalists Bronson Alcott and Ralph Waldo Emerson, as well as the seminal poet Walt Whitman, and journeying all the way to the many contemporary American guru-figures (many derived from Hinduism) that dot the religious landscape today. On page 99 of that journey, we’ve already made our way to the Beat movement, in particular to Jack Kerouac, Allen Ginsberg, Gary Snyder, and their circle, which also included William S. Burroughs. We’ve discovered that Jack Kerouac asserted a kind of spontaneous or immediatist mysticism derived from Buddhism, and that Burroughs was a surly and sinister critic of his friends’ turn toward Asian religions, and toward Buddhism in particular. The word “immediatism” is important to understanding the argument of the book—an immediatist mystic asserts that enlightenment or spiritual illumination is spontaneously available to us. After this point in the book, we turn from the Beat literature and its particular brand of immediatist mysticism to Timothy Leary and the impact of LSD on the hippie era, which also was characterized by immediatism. Indeed, not much could be more immediatist than the mysticism inspired by taking a pill. We also take a look at Stephen Gaskin, pied piper of the hippies, and leader of a caravan of buses across America, and at some religions conceived more or less as jokes, like Discordianism, (which “has no dogmas, but one catma”) and other forms of what I call “spiritual anarchism” that developed during and after the 1960s. It is not until late in the book that we get to the network of contemporary American satsang teachers that have proliferated, the most extreme of which teach what seems to be a kind of nihilism. Learn more about American Gurus at the Oxford University Press website, and visit Arthur Versluis's website. Yehudah Mirsky's "Rav Kook: Mystic in a Time of Revolution"
In those years, Aharon David Gordon, Rav Kook’s secular counterpart, was calling from his kibbutz for Jewish regeneration through nature as the life-giving alternative to the disembodied Jewishness of exile. Kook, like Gordon, sought redemption in and through nature, but characteristically wanted not to abandon the centuries of exile but to assimilate them into the dialectic of self-realization that is holiness. My book is an account of the life and thought of Rav (Rabbi) Abraham Isaac Kook (1865-1935), a colossal figure, immensely consequential in the history of modern Judaism, Zionism and the State of Israel. Largely unknown in the West, he was the founder of the Chief Rabbinate, and, more importantly, the first and still the greatest Orthodox rabbinic figure to endorse secular Zionism. Most rabbis of the time rejected Zionism, for its secularizing such hallowed traditional ideas as redemption, Jewish nationhood and the Land of Israel, as for its open revolution against Jewish tradition and attempt to supplant the tradition with a new, Hebrew culture. Kook, a brilliant Talmudist and widely read in Western culture, arrived in Palestine in 1904 from the Rabbinic heartlands of Eastern Europe, to become rabbi of Jaffa and the surrounding agricultural settlements. He was from them on thrust into the hard-fought culture wars around the Jewish national revival. He developed a singular perspective – that the Zionist and Socialist rebellions against tradition were actually to be welcomed, since they were nothing less than the first steps heralding the coming of the Messiah. Kook arrived at this perspective not only through broad-mindedness and a conciliatory personality, but also through his study of the Jewish mystical tradition, the Kabbalah. He was in particular drawn to doctrines which saw all of being as an arena of contending and complementary energies – tradition and change, the particular and the universal, body and soul – all reflecting God’s own complexity, all coming to final, magnificent and paradoxical resolution in the revolutionary changes of modernity. Kook’s laboratory was his spiritual diary, in which he brought the vast range of Jewish learning and his own theological intensity to bear both on perennial questions and the complexities of his time. Page 99 of the book is from the chapter about his diaries. This passage, the merest sliver of his vast output, presents his reflections on nature, to him as spiritually charged as anything else in creation – indeed, the Jewish people’s new return to the Land, to agriculture, to living in their bodies on their native soil, was to his mind part of a process in which the body and spirit, nation and ethics, would be unified, healing the alienation of God and world, Jew and gentile, body and soul. Kook died in 1935, thirteen years before the creation of the real-live State of Israel. Some of his disciples, after 1967, took his Messianic reading of the times as a call to settle the Biblical heartlands of Judea and Samaria. Others saw his ethical interpretation of the Jewish people’s historical mission as pulling in the opposite direction. His ideas and legacy are still widely studied and hotly debated in Israel today. The larger than life mix of passion and intellect coursing through his life story and writings makes even writings as seemingly esoteric as the one presented here deeply consequential for the pressing political and moral question that never goes away: How do we want to live our lives, as bodies and souls in our world? Learn more about Rav Kook at the Yale University Press. Michael Blanding is a Boston-based investigative journalist whose work has appeared in The Nation, The New Republic, Salon, Consumers Digest, The Boston Globe Magazine, and Boston Magazine. His first book, The Coke Machine: The Dirty Truth Behind the World's Favorite Soft Drink, was published by Avery/Penguin in 2010. His new book is The Map Thief: The Gripping Story of an Esteemed Rare-Map Dealer Who Made Millions Stealing Priceless Maps. At its height in 1870, Sebec was the largest town in Piscataquis County, with a population of more than a thousand people. Since then, however, its fortunes had ebbed as the lumber business had dried up and gone to Canada and the population dropped to only six hundred. Now Piscataquis is the second-poorest county in Maine and one of the most sparsely populated areas east of the Mississippi. Still, the town has retained a sparse beauty, with wooded hills rising over the lake, and dozens of historic homes clustered around the village center. Among the residents are summer visitors who own houses—still quaintly referred to as ‘camps’—on the lakeshore. Their children join the local kids jumping off the milldam bridge into the lake and running through the surrounding woods. In the dining room was a long wooden table, with matching wooded benches. Off the main hall, a children’s playroom was filled with antique toys—a hobbyhorse, a stuffed bear, and a dollhouse. And in the corner was Smiley’s office, where he retreated to look at maps and installed shelves for blues records and his father’s gardening book collection after he died in 1994. The only map hanging in the house was one that was there when they bought it—a map of Sebec Lake done for the Dover-Foxcroft Chamber of Commerce in 1962 that hung over the dining room table. On first blush, a small town in Maine might seem to have little to do with an international map thief, who admitted to stealing nearly 100 antiquarian maps valued at more than $3 million. But in fact, the small village of Sebec has everything to do with the grandiose schemes of Forbes Smiley, a respected map dealer who betrayed the world he loved by defiling maps and atlases from rare book libraries across the country and overseas. That’s because rather than spending most of his money on buying luxuries, Smiley spent it on buying Sebec. In addition to his farmhouse, he also bought up the town post office, and a general store and restaurant, refurbishing them to the tune of half a million dollars and spending thousands more employing much of the town in his businesses. Smiley had always loved New England history, and sought to make Sebec the perfect ideal of a New England village—and himself the benefactor of the town. Many residents supported him in his vision. Alas, however, not everyone shared it. When a couple across the street named the Moriartys tried to put in a noisy speedboat marina, Smiley and his friends got into a nasty feud that turned into a costly legal battle dividing the town. Smiley stole more and more maps to keep up with the money he was hemorrhaging on payroll and legal bills up in Maine. Eventually, Smiley lost his legal case in Sebec, and left the town, never to return. A year later, he was caught stealing maps at Yale University, and admitted to his crimes. The Moriartys celebrated, putting a picture of his mug shot in their marina window. Smiley had to sell his shops before he went to prison, but they were never redeveloped. Even today, they sit boarded up by the lakeshore, the tables in his restaurant still set as if it might open for breakfast in the morning. Little else remains of Forbes Smiley’s dream of putting an ideal New England village on the map.